This is part II on the Annexation of Redford — see Part I here. 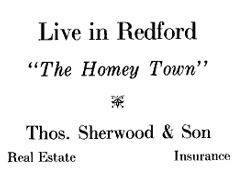 Popular sentiment in Redford leaned heavily toward annexation to Detroit by 1925, but only a vote could make it happen. In April of that year, a second annexation proposal went up for vote in Redford. The area included land south of the Pere Marquette Railroad. Voters in Detroit and in Redford, including the area in question, approved. The third and final ballot measure for annexation included another 10,500 acres of land containing 35,000 residents. The ad said: “thousands of persons living in the village and township of Redford and the communities of Five Points, Rosedale Park and Brightmoor are ‘mental’ Detroiters today. They work in Detroit; they speak in terms of Detroit and Detroit’s growth; Detroit’s problems are theirs and their problems Detroit’s. But these 35,000 persons… are penalized Detroiters” since they did not have full advantages of Detroit citizenship. In October 1925 residents made their stance officially known. Voters passed the annexation measure overwhelmingly. In less than a year, Redford went from 36 square miles to 11.2. The annexation went into effect in 1926. According to Lyle Kinsey in his history of Redford Union Schools, 17 of the 21 district schools that existed at the time came under the Detroit Board of Education as a result of the annexation. This included more than 5,000 students, leaving fewer than 450. The district no longer had a high school, since Redford High was included in the annexation. Voters in Redford agreed to pay tuition for students to attend Detroit schools until a new Redford Union High School was built. All Detroit annexations stopped in 1926. The reason is a little unclear, but perhaps Mr. Tupper’s claim (see Part I) of Detroit’s lack of development of newly annexed areas is an indication that the city had taken on more than it could handle. Real estate speculation slowed in the late 1920s, and in just a few short years, the city and nation would suffer under the Great Depression. Once the depression started, apparently no one was thinking about expanding the city’s borders. In 1947, Detroit made an attempt to annex the rest of Redford, as well as Livonia. The Township News (covering Southfield, Redford, Livonia, and Farmington) reported in its June 5, 1947 issue that one major point of contention was that taxes would allegedly triple. Twenty years after the annexation frenzy, suburban residents were no longer too keen to become city residents. Redford became a charter township after the Charter Township Act of 1947 passed – a status which afforded it greater protection against annexation attempts. Although we are the Redford Township Historical Commission, we do have materials from the ”Old Redford” areas of Detroit, from both before and after annexation. Materials include issues of the Brightmoor Journal, the Rosedale Record, directories, and collections from schools that were part of the annexation such as Redford High School and Holcomb Elementary. *In its March 5, 1925 issue, The Redford Record states that a map was being made by Detroit architects Verner, Wilhem and Molby, illustrating all the subdivisions and pieces of property, to be on sale later that week. The Redford Township Historical Commission does not have a copy of this map, but we’d love to have one – maybe it’s hanging out in your attic or basement? See our donations page for more information.